Mon thru Fri - 8:00 - 4:30. 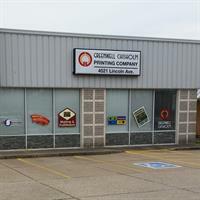 Greenwell Chisholm is the parent company of Greenwell-Chisholm Printing Company, GC Promotions and GC Mail and Fulfillment Company. We try to create an easy to work with environment for all your printed media needs. From knowledgeable, responsive sales staff to fast estimates and project turnaround times, Greenwell Chisholm makes your needs our priority. We remember you, making sure that your logo and colors are correct and of the highest quality, time after time. We respect your time and preferences, providing communication and proofs in whatever format is most convenient for you, digital or PDF. And we value your business, going the extra mile to deliver your finished order not just to your doorstep, but all the way to your storage shelves. With the latest in computer-to-plate technologies, new generation printing presses and full Internet capabilities, we have grown from a company that printed on “paper” to a company that can put your logo on virtually anything, from four-color brochures to pens, shirts, jackets, signs, banners, and almost anything you can imagine! One thing has never changed though: our commitment to quality and customer service. Those standards are the same now as they were when Greenwell Chisholm opened its doors in 1919!